Everything came up roses for my family this New Year&apos;s Day . . . in Pasadena, Calif. More specifically, in the grandstands along Colorado Boulevard at the 127th Rose Parade. 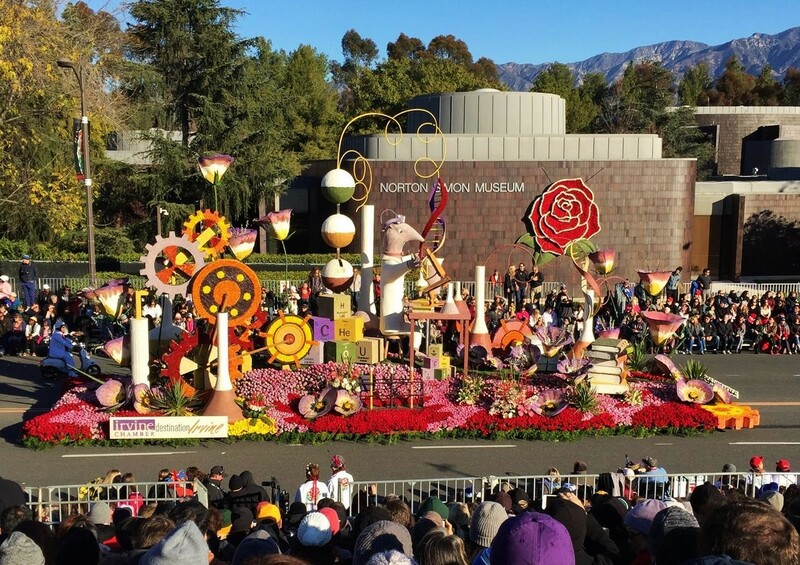 As a Destination Irvine sweepstakes winner, I received a free trip for four to the famous floral extravaganza with its gorgeous petal-covered floats, antique cars and wagons, equestrian units, and bold and brassy marching bands. Sons Darrel, 29, and Kevin, 27, were able to join Pam and me for the quick four-day trip from Oregon to southern California. They added some extra zest to the party. As a life-long Rose Parade buff, I entered the contest on Destination Irvine&apos;s website and was one of 12 winners out of 900 entrants. What a wonderful holiday surprise. I was just a kid my last time at the Rose Parade, so a return visit has been on my bucket list for quite a while. 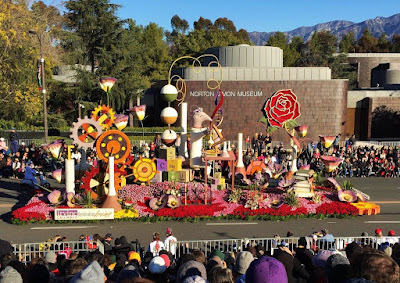 Destination Irvine is the convention and tourism connection at the Irvine Chamber of Commerce, which sponsored this year&apos;s Rose Parade float "Innovation Rocks." The float (see photo above) honored the University of California, Irvine&apos;s scientific breakthroughs in medicine and technology during its 50-year history. Note: You can read about us and other parade prize winners at www.destinationirvine.com/blog/post/2015/11/24/Destination-Irvine-sweepstakes-winners-will-find-their-California-adventure-at-the-Rose-Parade/266/. Our trip included airfare and hotel accommodations, so we took the two-hour Southwest Airlines evening flight from Portland to John Wayne Airport in Orange County, rented a car and made our way to the Hotel Irvine. We spent part of the next day (Dec. 31) sharing an early hamburger lunch with my Aunt Jerry and husband Jerry who live in Irvine. Then it was off on a sightseeing drive with an enjoyable timeout at Laguna Beach. There we did some window shopping and strolled on the beachfront boardwalk in California&apos;s winter sunshine. New Year&apos;s Day started early, as we made our 4 a.m. wakeup call, took the 56-mile motor coach ride to Pasadena and walked in the chilly dawn to the parade grandstands. We weren&apos;t the first to arrive, though, as people were packed in along the Colorado Boulevard sidewalks, many crawling out of sleeping bags and huddling around portable stoves for warmth, hot beverages and food. The Los Angeles Lakers, top, were proudly represented with a purple and gold float and jerseys of their Hall of Fame players. Below, the Palkes are bundled up for chilly grandstand parade viewing. From left, Darrel, Kevin, Pam and Ken. Pedestrians of every stripe kept the streets lively as we awaited the parade. More folks arriving every minute seeking clear viewing spots; vendors hawking seat cushions, balloons, souvenirs, food and drink; and a steady procession of loudspeaker-carrying, marching evangelists admonishing us to repent in a variety of languages. The street crowd opened a pathway every few minutes to let police cars and motorcycles zoom by unfettered, lights flashing and sirens blaring and beeping. With the sunlit San Gabriel Mountains as a backdrop, it was show time. Thousands of spectators along our section of pavement seemed to gasp collectively, then cheer wildly as they laid eyes on the first flower-festooned float. The spectacular "Nature&apos;s Hope" from Honda stretched 100-feet long and 24-feet tall. It&apos;s depiction in flowers of mountains, timbers, rivers and wild creatures saluted America&apos;s and Japan&apos;s national parks. Mount Rushmore was highlighted on South Dakota&apos;s breathtaking entry and characters from the Disney movie "Frozen" took their place atop the float celebrating the 60th anniversary of Disneyland. We enjoyed the next two hours of the parade, often wishing for a slower pace so we could appreciate each float, musical or equestrian unit for a moment longer. We sweepstakes winners belted out our loudest cheer for entry number 42 -- Destination Irvine&apos;s float "Innovation Rocks." One thing&apos;s for sure, Pasadena&apos;s grand parade is much better in person than on television. You get the sights, sounds and smells in glorious 3-D and its exciting stuff. The constant hum of the spectators; the smell of coffee and foods from many lands cooking on vendors&apos; stoves; the music, drumbeats and tapping feet of marching bands; the hoof beats on pavement of all those horses. And the floats . . . well designed and gussied up in their New Year&apos;s Day best with plants and flowers from around the world.It&apos;s unforgettable. Thanks Destination Irvine for the fabulous time. Floats from the Odd Fellows and Rebekahs and China Airlines-Taiwan, right, proceeded along Colorado Boulevard on parade route through Pasadena. Marching musicians, flowers and the California sunshine, below, made the 127th Rose Parade unforgettable.